Kashmir, India -- The First Great Diffusion of Buddhism in the trans-Himalayas was in the 8th century. Guru Padmasambhava established the religion in the entire mountainous region, from Ladakh in the west to Arunachal Pradesh in the east. He had studied at Nalanda University in eastern India. 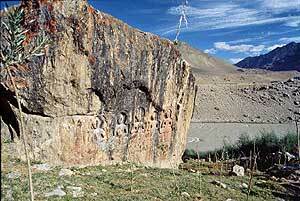 << DHYANI BUDDHAS, PADUM, Zanskar. These rock-cut Buddhas are in the Kashmiri style of art and are of about the 8th century A.D. Zanskar remains a remote area to this day and preserves an ancient Buddhist culture. Padmasambhava was a famed master of Tantric Buddhism and was called to Tibet when it was found that the people of that land were not taking to Buddhism easily. They remained fearful of evil spirits and demons, which they believed inhabited the mountains and the winds. The guru brought with him his greater magic, tamed the demons and made them defenders of the Buddhist faith. He swept across the high-altitude plateau with the Cham, or sacred masked dance, with which he purified the land and made it ready for Buddhism. To this day the Cham is performed across the entire mountainous region to keep the land pure for Buddhism to prosper. Padmasambhava continues to be deeply revered as a deity and is known as the second Buddha. King Yeshe Od came to the throne of Guge, in western Tibet, in the 10th century at a time when Buddhism had declined considerably in the trans-Himalayas. What troubled him the most was that even what little practice of the religion continued was impure and coloured by local magical rites. In A.D. 975, Yeshe Od sent Rinchen Zangpo on the arduous journey to Kashmir, the land that was a centre of Buddhism, to bring back scriptures with the original and pure knowledge of the faith. 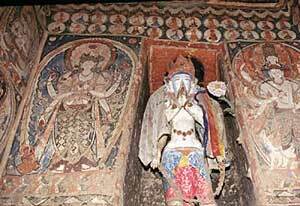 The mission was also to bring back artists to build, paint and sculpt new temples in Guge. Rinchen Zangpo spent six years in Kashmir, completing his own education and guiding his disciples. In the years to come, he became known as the revered Lhotsava, or great translator. His translations brought to Guge the true knowledge of Buddhism that the king had sought. In the 4th century, in the Buddhist centres of Kashmir, the Yogacharya school of thought developed. It held that the most effective method for the attainment of the highest truth was through meditation or Yoga, which means to become “one with the Eternal”. 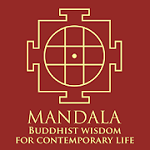 The different aspects of the wisdom of the Buddha were personified as the five Buddhas: Akshobhya, Ratnasambhava, Amitabha, Amoghasiddhi and Vairocana. Vairocana, who symbolises the mirror-like wisdom of the Buddha’s enlightenment, is the supreme Buddha in the Yoga tantras. Rinchen Zangpo had studied scriptures related to the mandalas of Vairocana during the time he spent in Kashmir. In this period, of the “Second Diffusion of Buddhism in the trans-Himalayas”, it was mainly temples devoted to Vairocana that were set up. Rinchen Zangpo translated the Sarva Tathagata Tattva Samgraha Sutra, “The Symposium of Truth of All Buddhas”, from Sanskrit to Tibetan. This was the principal text of the Yoga tantras. 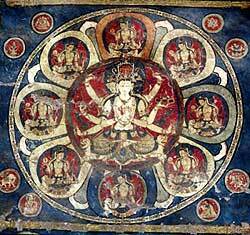 It is mainly the Vajradhatu mandala of these texts that was made in these monasteries, with Vairocana at the centre. It is believed by the people of the trans-Himalayan lands that Rinchen Zangpo made 108 monasteries and temples. He brought 32 artists to Guge from the Kashmir Valley. 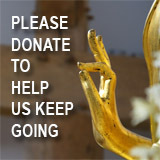 They were to create the foundations of a lasting tradition of Buddhist art in the trans-Himalayas. The painters and sculptors from Kashmir brought with them a highly sophisticated form of art, which was deeply rooted in the classic Sanskrit texts of India. In the 10th century, the Kashmiri guru Abhinavagupta took the Indian philosophy of aesthetics to rare heights of development. This was in a climate deeply imbued with the thoughts of Kashmir Saivism, which saw the beauty of the world as a reflection of the glory of the Divine. In the Indian philosophy of aesthetics, it is believed that the ecstasy one experiences on seeing something truly beautiful, whether in nature or in art, is akin to the final bliss of salvation. The moment of the experience of beauty is one of the highest states to be in, in which the veils of the illusory world are lifted and one sees the grace that underlies all creation. Thus, the ecstatic response to beauty was seen as a glimpse of the Truth itself. The artistic styles that flourished in the Valley were born out of the confluence of great cultures. The art of the plains of India in the Gupta age had attained a deep and inward look and a quality of sublime peace. This tradition of art met the rich influences of the vibrant cultures that came to Kashmir along the trade routes from Central Asia, China and even the Mediterranean. Such was the inheritance of the Kashmiri artists who made Rinchen Zangpo’s monasteries. The masters from Kashmir also trained local artists. There was a marvellous blending of the local idioms with the classic styles from Kashmir. From the 5th century onwards, the hallmark of the finest Indian art was the deep and inward look on the faces of the figures. The art of these monasteries continued this sublime tradition. What makes the paintings and sculptures here unique is their sense of lilting grace. A journey to the early monasteries of the Himalayas should begin at Nyarma, which is one of the three earliest monastic sites known of the period of the Second Diffusion and is clearly attributed to Rinchen Zangpo. The other two are Tholing and Khorja in Tibet. Nyarma is located a little off the main road heading south from Leh. Though the complex is now crumbling, even the shells of the many temples and chortens (stupas) at Nyarma give an indication of the original grandeur of the site. << SANI STUPA, ZANSKAR, made in the 1st century under Kanishka's rule, is the oldest Buddhist monument in the Himalayan region. The valley of Zanskar is an enchanted land. It is snowbound and cut off from the rest of the world for more than half the year. It is a holy place that preserves ancient Buddhist traditions. Karsha and Phugtal, two of the earliest monastic foundations in the Zanskar region, are ascribed to the Zanskar Lhotsava, who followed in Rinchen Zangpo’s footsteps. Spiti is another isolated Himalayan region. In a fertile valley in Spiti is the monastic temple complex of Tabo village. This is the earliest functioning monastery of the Second Diffusion and is believed to have been founded by Rinchen Zangpo in A.D. 996. Inscriptions at Tabo refer to the kings of the Guge dynasty who patronised the Tabo monastery. In 1042, a major renovation of the monastery was carried out. The sculptures and most of the paintings in the dukhang, or assembly hall, are believed to be of that period. The main assembly hall of the Tabo monastery is an architectural Vajradhatu mandala. Stepping through the doorway, one enters the mandala itself, all around which are sculptures and paintings depicting deities. A statue of Mahavairocana is seated at the apex of the arrangement. Mahavairocana represents supreme enlightenment. The deities around him emanate from his universal body and represent different aspects of him. As devotees enter the room, they become a part of the mandala. They make a clockwise pradakshina, or circumambulation, of the holy space of the mandala. The sculptures of the temple are made of clay. Thirty-seven, almost life-sized deities are placed at a height upon the wall without any support from the floor. This is in keeping with descriptions of clay sculpture techniques in Indian texts of the 8th and 12th centuries. They appear to hover in a heavenly space. The figures would all have originally held attributes – now missing – such as a book or a sword. In the Indic tradition of worship, devotees express their adoration through music and dance. They light lamps and make offerings of flower garlands and incense. In the mandala, these offerings are personified as goddesses. The goddess Vajralasya symbolises the grace of love, Vajranritya symbolises the offering of dance, and Vajradhupa symbolises the offering of incense. The facial type, the crown and jewellery and the other details came to this region through the Kashmiri artists who made them. A variety of artistic influences can be discerned in the details. Above all, it is the look of gentle benevolence and peace upon the faces of these deities that moves worshippers. In the cella, there is a Buddha flanked by Bodhisattvas behind the four-bodied Vairocana. Protective deities are placed on the entrance wall. They prevent the confusion of the material world from disturbing those inside. Not very far from Tabo is the village of Lhalung. The Serkhang, or Golden Temple, at Lhalung is one of the most beautiful creations of the entire Himalayas. The walls have been transformed into a heavenly realm, peopled with gentle Bodhisattvas and goddesses. These deities are arranged around a figure of the Sakyamuni Buddha. Indra is depicted below the Sakyamuni Buddha, worshipping him. His gentle expression and graceful posture make this one of the masterpieces of the Serkhang sculptures. On the left wall of the temple is a sculptural mandala of Vairocana as the Dharma-dhatu-vagisvara-manjushri. Here, he represents wisdom. He has eight hands, which would have originally held swords and manuscripts. The manuscripts symbolise knowledge, while the swords are to cleave through the darkness of ignorance. It is a world of serenity, yet one that elates the worshipper as he looks upon the intertwining creepers and mythical beings that populate the spaces between the deities. One can see the continuous vine of the creative blossoming of the world from which issue numberless forms. This has been a feature in Indian art since the 2nd century B.C., in the vedika reliefs of the Bharhut and Sanchi stupas. In Kinnaur, which adjoins the Spiti Valley, is a carved stone stele of the 10th century with an inscription of Yeshe Od. It speaks of the time of the Second Diffusion when it says, “the religion of God and man was taken to its peak”. An original wooden pillar capital survives in the Lhotsava Lakhang in Shalkar village in Kinnaur. It is carved clearly in the Kashmiri style of the 10th to the 12th centuries. The village of Nako, at about 13,000 feet (3,900 m), in Kinnaur has an early temple complex. The main temple is called the Lhotsava Lakhang, or the temple of the great translator Rinchen Zangpo. A Vajradhatu mandala is painted on the left wall of the temple. This temple has some of the finest surviving wall paintings of this period. The surviving clay sculptures at Nako exhibit close similarities to the other temples of the period in the trans-Himalayas. The central deity is Vairocana, who performs the gesture of the “highest enlightenment”. He has an elaborate throne frame with makaras and a Garuda at the top. Garuda, who is the vahana, or vehicle of Vishnu, was made in the main shrine of all the Buddhist temples of this period. 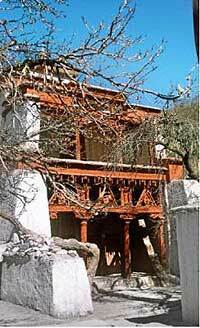 The remote temple of Charang in Kinnaur is also believed to have been founded by Rinchen Zangpo. It continues the tradition of fixing statues of deities high upon the walls. The main deity here is Vairocana, and the statues upon the walls appear to form an architectural mandala. 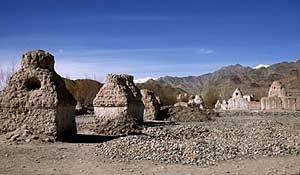 Located in fertile pockets of the river valleys of Ladakh are the closely associated temple complexes of Alchi, Mangyu and Sumda. All three are believed by the people of Ladakh to have been created by Rinchen Zangpo in one night. The entrance to the dukhang at Alchi is a fine example of detailed wood carving in the Kashmiri style. There are rearing leogryphs here. These fearless animals inspire one to awaken one’s courage within and dispel resolutely the demons of confusion. Inscriptions ascribe the founding of the Alchi dukhang to Kalden Sherab, a monk who belonged to the village of Sumda. He had studied at nearby Nyarma. The shrine of the dukhang has fine clay figures, with Vairocana at the centre. These graceful forms elevate one through one’s response to their beauty and joyousness. The entrance to the Sumtsek, or three-storied temple, is delicately carved in the Kashmiri style. Figures are framed in architectural forms seen in the temples of Kashmir since the 8th century. A special feature of the interiors of the temples of Ladakh of this period is colossal figures of Bodhisattvas. These are made of mud and stand two storeys high. The dhoti of the 18-foot-high (5.4 m) Avalokitesvara statue in the Sumtsek is covered with fine paintings. These constitute the richest visual record of the culture of Kashmir of that period. Buddhist and Brahmanical shrines and deities, musicians and dancers, and princes hunting on horseback cover the painted surface of the dhoti. One can see the continuation of the tradition of fine shading and the rendering of form of the classic Indian idiom. One can also see the vitality of the more stylised medieval idiom. The influence of Persia is seen in the intricate detailing and the miniaturisation. This was one of the richest confluences of cultures anywhere in the medieval world. The Manjushri Lakhang is another temple in the Alchi complex, also of the period of the Second Diffusion. Four figures of the Bodhisattva Manjushri face the cardinal directions. They are seated on lion thrones and would have held a sword (to cleave through the darkness of ignorance), an arrow, a lotus and a book. Downstream from Alchi, on the left bank of the Indus river, is the path that heads towards the village of Mangyu, at an altitude of about 11,400 feet (3420 m). The art of the temple complex here is very similar to that of Alchi. The tradition of brihad, or colossal, Buddhas is continued here: there are Bodhisattva statues that are over 12 feet (3.6 m) high. A stupa at Mangyu has the most beautiful interior of any in the trans-Himalayan region. There are fine statues and paintings here of the period of the Second Diffusion. The monastery of Sumda, at about 13,000 feet, is the third temple complex supposed to have been built in one night along with Alchi and Mangyu. What makes Sumda remarkable is the almost entirely preserved Vajradhatu mandala made of clay. All the figures are dressed in dhotis, many of which are finely decorated. Thirty-seven figures create an ordered universe. Flying figures bear offerings for the deities, who represent one’s inner qualities. There is a joy that pervades this world of purity and graceful form. The experience of joy lies at the heart of the Buddhism that came to Ladakh during the Second Diffusion. The concept of Yoga stresses the oneness of everything in creation. This art, permeated with a sublime sense of grace, brings the worshipper closer to that ecstatic realisation. In the vast and bleak desert lands of the trans-Himalayas, the temples of the Second Diffusion of Buddhism are like an oasis of colour. The architecture, the sculpture and the paintings are all part of a unified, sacred plan. Their purpose is to move and transport one far from the cares and confusions of the material world, to the depth of the peace to be found within. Inside these temples, one enters an enchanted space. It is a world of graceful forms and colour, which takes one into the deep and harmonious spaces of the inner self.